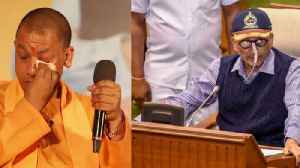 ▶ Videos for "Goa Chief Minister"
Uttar Pradesh Chief Minister Yogi Adityanath expressed his grief on demise of Goa Chief Minister Manohar Parrikar. He said, "it is a really saddening news. As the chief minister of Goa and Defence..
Goa Floor Test LIVE updates: New Goa chief minister Pramod Sawant has won the confidence motion with support of 20 MLAs. This means that BJP has passed the floor test at the Goa Assembly. Fifteen of..
As cancers go, Goa chief minister Manohar Parrikar was dealing with a particularly tough one. Pancreatic cancer has one of the worst survival rates among cancers and is a type that is hard to screen..
Close friend Tarun Vijay pays tribute to the four-time Goa chief minister and former defence minister who passed into the ages on Sunday. Shortly before the clock struck 2 am Tuesday, Pramod Sawant, 45, Goa's Speaker until that moment, took over as the state's new chief minister succeeding Manohar Parrikar's who died less than 48 hours..
Goa CM Manohar Parrikar Funeral LIVE updates: According to reports, Goa Assembly Speaker Pramod Sawant is set to be the next Goa chief minister as the BJP has reached a consensus with its allies. Goa CM Manohar Parrikar Funeral LIVE updates: A State funeral is being accorded to the Goa chief minister. Meanwhile, speaking to reporters, Nitin Gadkari said, "No final decision has been taken..
Goa CM Manohar Parrikar Funeral LIVE updates: BJP leaders in Goa have hinted that in case consensus is not reached with the allies regarding the new Goa Chief Minister, the government will appoint two..
Manohar Parrikar Dead; Goa CM funeral LIVE updates: According to TV reports, after several rounds of discussion two names have emerged as the top choices for the CM post - Pramod Sawant and Vinay..
Goa legislative assembly speaker Pramod Sawant is most likely to emerge as the successor to Manohar Parrikar as Goa Chief Minister, a source said. Parrikar died on Sunday after suffering from a..
Manohar Parrikar Dead; Goa CM funeral LIVE updates: BJP Goa president Vinay Tendulkar has said that the party will reveal the name of the new Goa chief minister by 2 pm on Monday and one can expect the..
Goa Chief Minister Manohar Parrikar died after a long illness on Sunday evening at the age of 63. 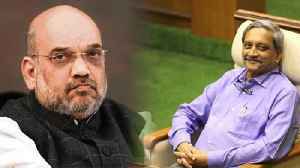 Parrikar, a former Defence Minister who had been battling pancreatic cancer for over a year, died at..
Union minister and senior BJP leader Nitin Gadkari on Monday held talks here with party leaders and alliance partner Maharashtrawadi Gomantak Party (MGP) to select a new Goa chief minister following..
Manohar Parrikar Dead; Goa CM funeral LIVE updates: According to several reports, after paying last respects to the Goa Chief Minister, Union Minister Nitin Gadkari has reportedly began round two of..
Manohar Parrikar Dead; Goa CM funeral LIVE updates: Goa chief minister Manohar Parrikar's mortal remains is being taken to the state BJP headquarters, media reported. 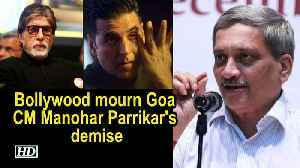 While reports are saying that..
Manohar Parrikar Dead; Goa CM funeral LIVE updates: Goa chief minister Manohar Parrikar's mortal remains is being taken to the state BJP headquarters, media reported. Parrikar, who died after battling.. While the country observes a national day of mourning on Monday after the death of "well-loved" Goa chief minister Manohar Parrikar, several prominent politicians, journalists, and activists..
As the mess secretary of hostel 4 on IIT-Bombay’s campus, late Goa chief minister Manohar Parrikar was very strict with students and even the mess workers in those days. Goa Chief Minister Manohar Parrikar passed away at the age of 63 on Sunday evening. Several Bollywood celebrities took to their Twitter pages and expressed their grief.